More speed activated warning signs are being installed in Nottinghamshire after research showed they had a significant impact on speeding. 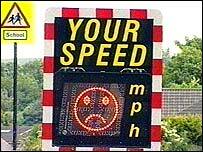 A 12 month study has revealed that the flashing signs have reduced speeds by an average of 6%. Sixteen signs carrying flashing messages have been installed at a cost of £5,000 each around the county. They either warn the driver to slow down if they are exceeding the speed limit or flash a warning signal about a bend in the road or crossroads. They have been generally installed at traffic blackspots or where someone has died in a collision. Nottinghamshire County Council has been monitoring the signs over the last year and has concluded drivers do take heed and hit the brakes when the signs start flashing.